WWII German Panther tank commanded by Ernst Barkman, 4/SS-Pz.Rgt. 2, 2nd SS-Pz.Div. "Das Reich". Small crest on front, large design on back. 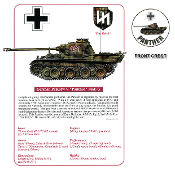 Large design features historical text and tank specifications. One-sided design has large image on front, nothing on the back. Available as a T-shirt or a Sweatshirt. Comes in Ash-Grey, White or Natural.